We’d love your help. 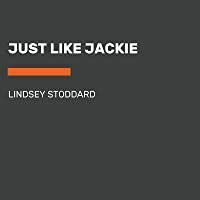 Let us know what’s wrong with this preview of Just Like Jackie by Lindsey Stoddard. For as long as Robinson Hart can remember, it’s just been her and Grandpa. Robbie knows they look like an odd pair, because her blond hair and pale skin don’t match his dark complexion—but those differences don’t mean anything to her. And though she wishes Grandpa would tell her more about the rest of her family, she’s learned over the years that he doesn’t like to talk ab For as long as Robinson Hart can remember, it’s just been her and Grandpa. Robbie knows they look like an odd pair, because her blond hair and pale skin don’t match his dark complexion—but those differences don’t mean anything to her. And though she wishes Grandpa would tell her more about the rest of her family, she’s learned over the years that he doesn’t like to talk about the past. To ask other readers questions about Just Like Jackie, please sign up. Almost finished and LOVING this book--but help me out... did I miss the Harold and Paul's car (?) is named "She Roll"?? I first noticed it on page 188, but was that the first time it was used? Roxana Rathbun It's a Chevrolet, but it was missing some of the letters, so it read Che Role or something to that effect, so as a joke they named it "she roll". This is a amazing book targeted for 8 to 12 year old's and I would have loved this as a child. As a adult i simple ADORE it. Laugh, cry, and relate to this wonderful gimps into the life of a struggling girl named Robinson aka Robbie. She doesn't have the best of tempers and when resident bully Alex doesn't leave her alone she punches him in the nose. Little did she know that this would be the start of when everything changes. Follow her through her struggles as she finds out that not everyone ha This is a amazing book targeted for 8 to 12 year old's and I would have loved this as a child. As a adult i simple ADORE it. Laugh, cry, and relate to this wonderful gimps into the life of a struggling girl named Robinson aka Robbie. She doesn't have the best of tempers and when resident bully Alex doesn't leave her alone she punches him in the nose. Little did she know that this would be the start of when everything changes. Follow her through her struggles as she finds out that not everyone has a perfect family, or a big one either, but family can be what you make it not just what you have. This beautiful story and powerful protagonist definitely made me tear up at least twice. The novel seamlessly weaves into its Vermont-embedded narrative considerations of family (and what that means), race, gender, Alzheimer's, and more - all through the lens of an inspiring fifth grader and her life with her grandpa. Probably 3.5 stars. I liked this but did not love it - I think one of my main reservations is baseball as a theme. I can think of one student who is into baseball and yet it continues to be a predominant theme in children’s literature. As for the book itself, there was a lot to appreciate even if it didn’t totally win me over. Fierceness and compassion move this story. It can feel rare in children's lit, that educational and mental health professionals are shown to be competent and doing what is best for the situation. Often when a story needs a heavy, poor teaching or bad counseling stand as a foil. I appreciated that in this book everyone around Robbie is supportive, without solving her problems for her. I went away to college at about the same time my grandfather went away to a facility that could care for him and his Alzheimer's. Visits with him were rough. In fact, I only visited him one time because instead of his grandson, he thought I was some buddy from the war he had been stationed with. It was one of the most awkward, saddest conversations I've ever been a part of. I had lost my grandpa for good even though he was physically sitting right next to me on a bench, patting my leg. What a boo I went away to college at about the same time my grandfather went away to a facility that could care for him and his Alzheimer's. Visits with him were rough. In fact, I only visited him one time because instead of his grandson, he thought I was some buddy from the war he had been stationed with. It was one of the most awkward, saddest conversations I've ever been a part of. I had lost my grandpa for good even though he was physically sitting right next to me on a bench, patting my leg. What a book, Just Like Jackie is! So many raw, tender moments mixed with gut-punching devestating ones. Robbie's voice is so true and reads exactly like a girl in her situation. This sounds like a real kid, with real struggles. Robbie struggles to control her temper, and struggles with taking care of her grandfather, and struggles with not knowing anything about where she comes from. Her relationships with teachers like Ms. Gloria, and adults like Harold, and kids like Derek and Alex, are so fantasically portrayed. I think Stoddard has taken great care in writing about Alzheimer's and how it would impact this unique family situation. "I don't know what my core is made of except maybe Grandpa's one-quarter, but it's not all syrupy sweet, that's for sure. It's not like the center of a perfect sugar maple. It's tight like a knotted piece of firewood, gnarled and hard to chop through." "I want to tell Harold about how Grandpa wandered away Friday night and almost got lost up in the woods. And how I think Grandpa's check engine light is on and I don't know how to figure out what's wrong. But I hope it's something as easy as a missing gap cap. And that we can get a new one, on the house, and drive off all fixed." "I want to laugh and point and say Who's tough now? but all I can do is stare because it's like watching a high-class, fully loaded BMW break down literally right in front of you. Lost brakes, locked steering wheel, wild swerving, and flat tires on wobbly rims. It's pathetic." A deeply moving, beautifully told story of a girl and her grandfather. Perfection! This book is so important. I’ll be recommending it to all of my middle grade readers. Loved this one too! "Respect the Wand" ~ love the magic of the talking wand....we could all benefit by using the wand lol! Set in rural Vermont, Just Like Jackie is about a young girl's connection with her grandfather. Robinson is all tomboy. I don't know if that term is even considered politically correct anymore given the current social climate but Robbie harkens back to characters such as Jo March and Scout Finch. Fists flying, sports loving, dress hating girls. Archaic as the term may be, it is the best way I can describe this spark plug. Robinson has never known either of her parents; her father was never in th Set in rural Vermont, Just Like Jackie is about a young girl's connection with her grandfather. Robinson is all tomboy. I don't know if that term is even considered politically correct anymore given the current social climate but Robbie harkens back to characters such as Jo March and Scout Finch. Fists flying, sports loving, dress hating girls. Archaic as the term may be, it is the best way I can describe this spark plug. Robinson has never known either of her parents; her father was never in the picture and her mother died just days after giving her birth. Raised by her grandfather, she learns the tools of his auto mechanic trade, how to extract and harvest maple from the trees on their property, and the career of her namesake, baseball's great Jackie Robinson. Well-written, well-developed characters. It doesn’t feel like an “issue” book because it’s all handled in an organic and story-based way. One of the things I like best about it (even though this is more of a didactic plus, I suppose, than a literary one) is that it’s really good at modeling. She’s dealing with a lot and wants to deal with it on her own, but she’s surrounded by adults who care about her and want to help—and who actually do help. If I were a kid, I think I’d feel a lot better abou Well-written, well-developed characters. It doesn’t feel like an “issue” book because it’s all handled in an organic and story-based way. One of the things I like best about it (even though this is more of a didactic plus, I suppose, than a literary one) is that it’s really good at modeling. She’s dealing with a lot and wants to deal with it on her own, but she’s surrounded by adults who care about her and want to help—and who actually do help. If I were a kid, I think I’d feel a lot better about asking my guidance counselor for help after reading this book. Loved this book! It grabs you right away on page 1. I know my students will love this book. This book i Stoddard, Lindsey. Just Like Jackie. HarperCollins, 2018. Robinson lives with her grandfather Charlie in a small town in Vermont. It's always been just the two of them. One boy at school, Alex, gives her a hard time, never calling her the name that she wants to be called (never Robin, sometimes Robbie) and making fun of the fact that she looks very little like her African-American grandfather. After she hits Alex yet again, she gets sent to group counseling, which Alex attends as well. Many of the children in the group are not happy about the latest school assignment, a family tree, because they don't have a lot of information about their families, or are dealing with serious family issues such as divorce or illness. Robbie is dealing with Charlie's worsening dementia. He runs the local car repair business, and luckily has a good assistant, Harold, to watch out for him. Harold, however, is very busy with the new baby daughter than he and his partner Paul have adopted, so Robbie tries to cover her grandfather's condition up as best she can. When she can no longer do this, she finally gets the help she needs. Strengths: This was a quick and oddly compelling read. So many students have family tree type assignments, and they always worry me for the very reasons mentioned in the story! It is interesting that Robbie and her grandfather don't look alike, and the back stories about the grandmother and mother ring true. This had a Patricia MacLachlan feel to it, with a touch of Miracles on Maple Hill. Weaknesses: The idea that Robbie would be more stoic and calm like her namesake, Jackie Robinson, was an interesting one, but didn't get developed as much as it could have been. This book is a MUST read for teachers, families, librarians, and anyone who cares about children! Robinson, named for Jackie Robinson, lives in Vermont with her grandfather, her only family member as far as she knows. She works through lots of challenges with the help of a guidance counselor at school, along with some of her peers. I could not put this book down, such a strong first novel. Well done, Lindsey Stoddard. You have captured the actions and emotions of a young adolescent. Great voice, but some plot elements and character developments felt a little exposed--like I could see the author working behind the scenes. Also a bit weird just in my 2019-Newbery-contender reading that this book is ALSO set in Vermont (/Small Spaces/) and ALSO includes group therapy (/Harbor Me/). Great concept and I really enjoyed the first few chapters. But there is a lot that isn't plausible and hard to ignore. Maybe I will pick it up another day. I have a good idea on how Just Like Jackie ends. back after stepping in to Robbie’s world. A stunning text. Teachers, parents, lovers of plain old beautiful stories...this is a book for all of us, and certainly a classroom library must! This review has been hidden because it contains spoilers. To view it, click here. My reading passion is for middle grade level books that so clearly connect to their readers. Middle school years are emotional roller coasters and our students and children need to see characters in the same situations learning how to handle fear, pain, grief, and continuing with and despite them. This book hits a home run with issues. Family issues of divorce, Altzheimer's, racism, Cancer, and so much more at the heart of this story, yet nothing is forced or out of place. 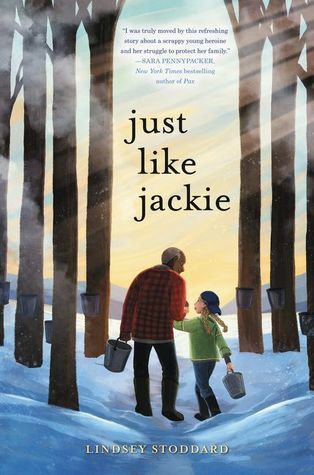 Just like Jackie is a My reading passion is for middle grade level books that so clearly connect to their readers. Middle school years are emotional roller coasters and our students and children need to see characters in the same situations learning how to handle fear, pain, grief, and continuing with and despite them. This book hits a home run with issues. Family issues of divorce, Altzheimer's, racism, Cancer, and so much more at the heart of this story, yet nothing is forced or out of place. Just really sweet and well-written. I would want this on the Newbery Honor list. Snowy Vermont with it's maple syrup is a delicious setting of Robinson's story. I found myself rooting for Robinson as she fought to find peace with her "family tree". I couldn't put the book down. Good read. Ooof, this book. It reminds me quite a bit of The Great Gilly Hopkins (one of my favorite books as a child) in that (a) Robinson has all this yearning for a family she knows nothing about and (b) she is so completely full of anger. This offers some coping mechanisms for children who may have similar anger problems, but it also shows compassion for the other characters and explains why bullies can be that why, as well as that sometimes people are just insensitive and not actively mean. I loved thi Ooof, this book. It reminds me quite a bit of The Great Gilly Hopkins (one of my favorite books as a child) in that (a) Robinson has all this yearning for a family she knows nothing about and (b) she is so completely full of anger. An unforgettable character in a truly unique story. Robinson is one tough cookie who rejects anything except her inner mission: to protect her Grandpa (her Only family) and prevent ones from knowing about his failing memory and independence. No matter how hard she tries to remember the coaching tips of the school counselor, her anger escapes. It’s not that she doesn’t have good reasons for he short fuse. These characters, adult and kids, ring true and memorable. "...family is something you get... but it's also something you make." So true and such a good message (among others) in this great middle grade read. Definitely recommend! I absolutely loved this book! There is something for everyone in this book. No matter who you are, you will find a character to relate to. This is a heartbreaking, beautiful story of family, aging and compassion. Will be booktalking this to the upper elementary students at my school.